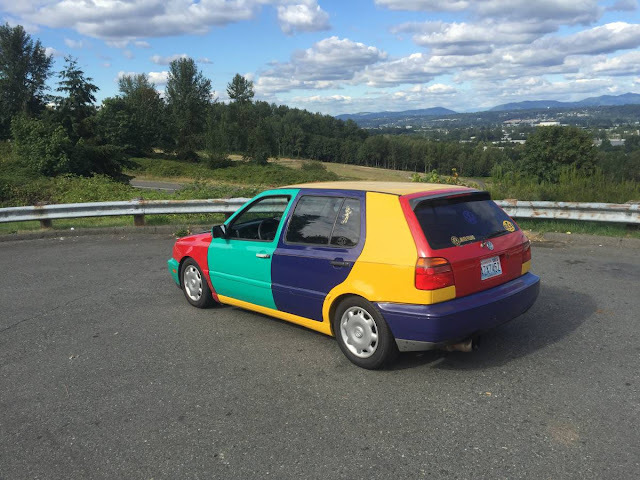 Update 11/24/2014: The seller has dropped the price to $5,500 and has asked if the price is too high...what do you guys think? Is $5,500 fair for one of the best 90s sport sedans built? Original Post 9/26/2014: Whenever I start talking about the E36 M3, folks get this far-away look in their eyes and sometimes fake a cell phone call. Do you hear that buzzing, that must be my phone. Wait wait, I shout, the E36 M3 may have the interior quality of a stone age raft and the rear end is held in place with adobe, but the engine is bulletproof and the chassis is more communicative than the chatty Cathy who sat next to you in science classa and was popping Ritalin like they were Tic Tacs. 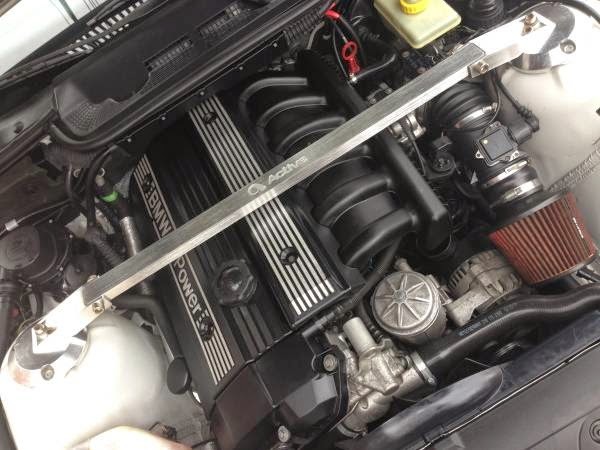 Find this 1999 BMW M3 Convertible offered for $6,100 $5,500 in Brooklyn, NY via craigslist. Seller submission from Rus. 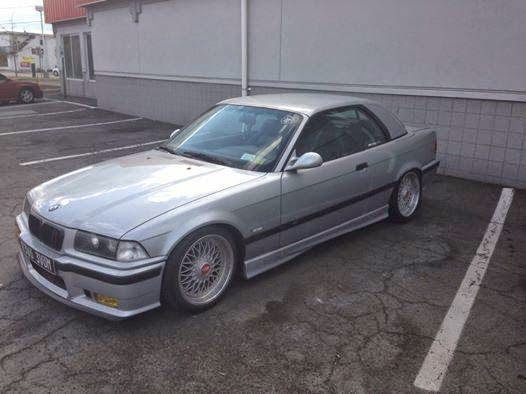 The E36 M3 market is really good for buyers, even low mile minty clean examples...hey...hey, where are you going...why do people keep doing that. This isn't a 100% stock example, and the seller concedes it does need some work, but where else are you going to find a fast hard top convertible with a set of usable rear seats for this cheap? Under the hood is the legendard S52B32, a 3.2 liter inline-6 that was rated at 240 horsepower and 240 ft-lbs of torque. The US spec M3 may have been almost 100 horsepower down from the European version, but the US version is known for excellent durability. You might hear all kinds of funny noises from the engine, but it just keep running. This one has only 127k miles on the clock and it should be good for many more. I just don't get this blocking out the license plate silliness. In some states you can view who owns the car and the address if you submit proper forms to the DMV. Most of these states require a pretty darn good reason as to why you need to see the ownership details. I think the blocking out of license plates is insanely stupid. Not only does it make the ad look bad, it also prevents me from running any autocheck/carfax reports on vehicles where the owners didn't provide the VIN number for the same silly reasons. I have one of these, despite a strong personal conviction against sports cars which have had their roofs chopped off (versus cars designed to be roadsters), and if you weigh it as a summer-night cruiser rather than a Sunday-afternoon race car these cars are stupidly juvenile-delinquency inducing. Interiors are utter crap, but when you're drifting it out of the school parking lot after dropping off the kids it feels and sounds so good you don't care. Or so I hear. Hardtops on a convertible version of a coupe always intrigue me. 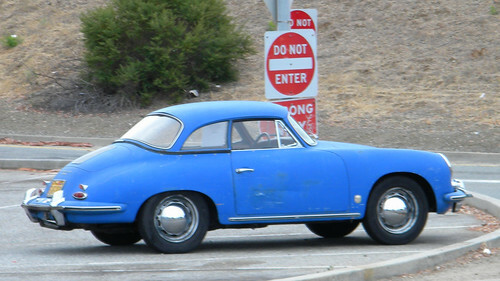 Like this 356 . Nice looking car, other than the typical NYC bumper destruction. I never understand the "you have to have the money to test drive" attitude- Is it an east coast thing? Do I actually need to bring $6k in cash to drive the car? I'm never going to meet anyone on Craigslist with more than $5 in my pocket. I let anyone drive a car I have for sale. I figure I have insurance, and if someone test driving my car steals it I no longer have to deal with selling it. Win-win! That's a typical request with motorcycles, as they are more personal machines and crash/drop damage is a higher possibility. Usually don't see it with cars. The nice thing about selling motorcycles is getting to reasonably ask to see their motorcycle endorsement on their license which confirms who they say they are and where they live as you listen to your bike drive away. Dropped the price to $5500. As for covering the plates. I dunno why people do that. Thought I'd follow the mob on this one, then just posted a better photo to craigslist, because I agree with you. 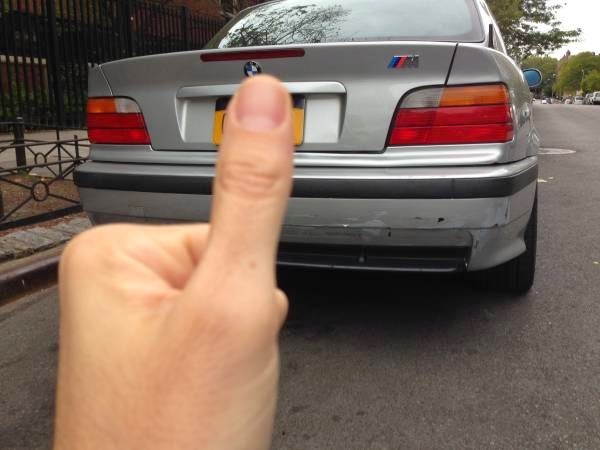 As for 'you need money to test drive' I just wanted to dissuade some people in NYC who I thought would just want to toss an M3 around for 20 minutes. I wouldn't do it myself, but I've thought about it, there are so many great cars within 15 minutes drive. I hate soft tops.. But I do like one with an included and installed hard top. I'd get rid of all the convertible bits and leave the hard top. He isn't blocking the plate, he is just giving the car a thumbs up. No way would I buy a NYC car. The roads re automobile torture.